It is one of the hamstring muscles that runs down the posteromedial aspect of the thigh. It is so named due to its long tendon of insertion. 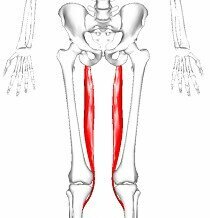 It runs very close to the other two hamstring muscles, arising from a common point with biceps femoris and running superficial to semimembranosus. 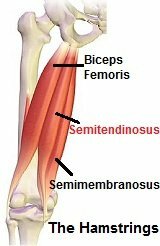 Semitendinosus and biceps femoris share a common tendon origin arising from the lower medial facet of the lateral section of the ischial tuberosity. After a short distance, the tendons divide and semitendinosus forms a fusiform muscle belly (wide spindle shape like a feather) before quickly giving way to a long tendon. This tendon passes downwards and slightly medially (inwards). It runs behind the medial femoral condyle, being separated from the medial collateral ligament (MCL) by a bursa (small fluid-filled sac), and attaches to a vertical line on the medial tibial condyle. It sits just behind the insertion of the Sartorius muscle and just behind and below the attachment of the Gracilis tendon. These three tendons form the Pes Anserinus, thus named due to the appearance resembling a webbed “goose’s foot”. Underneath these tendons site the Pes Anserine bursa, a small fluid-filled sac which helps to reduce friction which can often get inflamed if the hamstrings are tight. Semitendinosus works with the other hamstring muscles to help extend the hip when the trunk is bent forwards for example when straightening up from bending down to the floor. It also helps to bend the knee. If the knee is in a bent position, it will medially rotate the knee (turn it inwards). If the foot is fixed on the floor, semitendinosus will laterally rotate (turn outwards) the pelvis and femur on the tibia. The hamstrings also play an important role in stability, working with the abdominal muscles and glutes to control the fine balancing and position of the pelvis when standing such as the anteroposterior tilt of the pelvis and lumbar lordosis. They also control the forward movement of the tibia during the swing phase of walking and running, working eccentrically to decelerate knee extension.